As far as we are aware, AquaMarine Diving – Bali is the only company to dive here. Located between Secret Bay/Gilimanuk and Labuan Lalang (the dock for local boats over to Menjangan Island), the diving at Bayu’s Place is done by boat. Although the water temperature is usually 27-30°C, the visibility is variable (can be as low as 10m). However conditions are very calm with no current, making this dive location suitable for all levels. Much of the area is rubble and coral, with white sand, although there are some pinnacles. 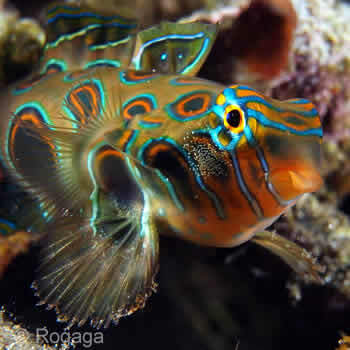 It is usually very easy to see Mandarinfish in the shallows, even at midday, along with Pyjama cardinalfish, ghost pipefish, batfish, Demon stingers, many kinds of gobies including Signal goby, nudibranchs, Blue-ring octopus, and many species of shrimp including Whip-coral shrimp.